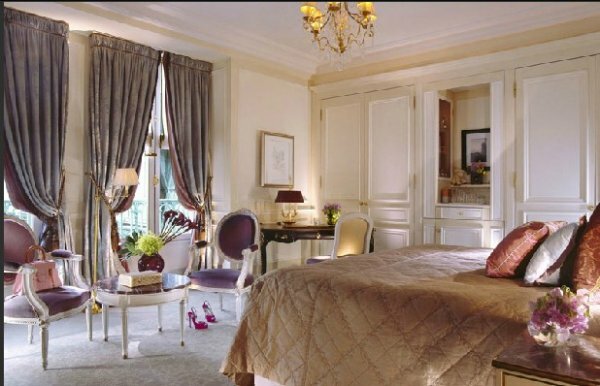 Ideally located opposite the Tuileries Garden, between Place de la Concorde and the Musee du Louvre, Le Meurice has held sway as the jewel in the crown of French luxury hotels since 1835. Reflecting its uninterrupted attachment to the French art of living, Le Meurice is a magical, serene place, where the refined splendours of 18th-century architecture meet the latest in contemporary comfort and elegance. 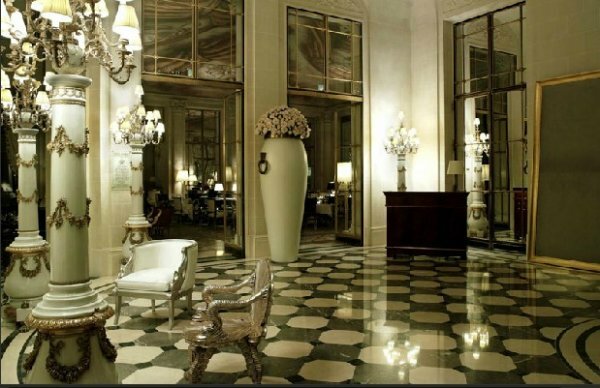 The Hotel Le Meurice, first Parisian palace (1835) has been enhanced by a new “daliesque” decorating imagined by Philippe Starck. Once again, the hotel dares a new adventure by placing new Valmont treatments. Valmont is an upscale Swiss brand of cosmetics which proposes face treatments like the Glaciers Moisturising Vitality Treatment (1h30-200 €) or the fresh new treatments like the Eye Contour Lifting Intensive treatment in exclusivity at Le Meurice (50 mn-150 €). For the body, a wide massages range which uses the “Thermes Marins de Saint Malo” products is proposed, like the Exclusive “Meurice” body massage (50 mn-120 €). Finally, to leave the Spa Valmont with a healthy glow to your cheeks, a little touch of make-up signed “By Terry” will delight the most coquette women! You will be fond of the exquisite rose balm (39 €). The new Spa Valmont for Le Meurice is an incontrovertible address not to be missed with its “3 in 1” concept which enables you to leave with a perfect face, body and complexion. The sunny terrace is equiped with umbrellas, deckchairs, and little tables to freshen up, have a light lunch and enjoy the spring menu: fresh salads full of vitamins, carpaccios, light sandwichs, Detox macarons, fresh fruits and vegetables juices, frappucinos, ice teas and so on. Spa open from 8am to 10pm for the fittings and from 10am to 8pm for the treatments from Monday to Sunday. The separate 80-square-metre (860-square-foot) fitness center offers the latest equipment, including free weights and cardio-training machines by Star Trac and Concept II. Why settle for the ordinary, when you can lend your next big event some real panache by holding it at Le Meurice in one of the five reception and conference rooms? 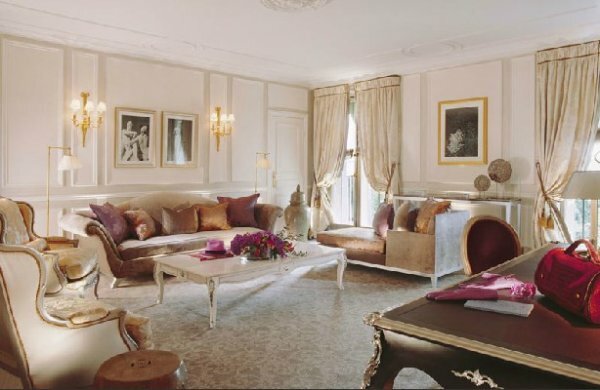 Le Meurice offers five banqueting rooms on the ground floor of the hotel, three of which are connecting, including the ceremonial Salon Pompadour. These rooms can accommodate receptions from 5 to 450 people, for breakfasts, luncheons, meetings, fashion shows, cocktails, and dinner parties. The Pompadour Salon’s fabulous gilt trimmings and decorative woodwork may be remands of another era, yet they remain the perfect backdrop for contemporary gatherings ranging from fashion shows to wedding banquets. The hushed surroundings of the Tuileries and Jeu de Paume Salons are equally exquisite venues to make a stylish statement. And since January 2008, let’s be seduced by the two new conference rooms called Le Grand Castiglione and Le Petit Castiglione. These two new places welcome your professional meetings and conferences around light and healthy lunch. The decoration is very modern with uncluttered and white furniture. All menus and lunch trays are supervised by our three star Chef Yannick Alléno. Ideally located opposite the Tuileries Gardens, the Hotel Le Meurice, is the ideal setting for celebrating one of the most important days of your life. Le Meurice is a magical, serene and elegant place, where the refined splendours of 18th-century architecture meet the design of Philippe Starck. But it is also where Yannick Alléno, the French three-star Chef at the head of the kitchens of Le Meurice, celebrates the seasons with his culinary creations. His heavenly cuisine elevates Parisian gastronomy to the rank of art. For your wedding, every detail will be considered and every expectation exceeded with the renowned service and iconic elegance that the hotel has long been known for. Offering 4,500 square feet of sophisticated event space from the scenic Salon Pompadour to the modern Castiglione ballrooms, this landmark hotel in the heart of Paris is the perfect place for the perfect beginning. Thanks to its perfect location in the 1st district of Paris, the families can relax at the hotel and the children have fun. We organize visits to the Jardin d’Acclimation, the Parc André Citroën, or even cruises on the Bateaux-Mouches. Children can do some Carousel rides in the Tuileries Garden while the mothers do shopping on the Rue du Faubourg Saint-Honoré. They can also play with custom-made toy wooden boats to sail in the boat pond in the Tuileries Garden. A treasure hunt is organized at the hotel with the Pistache mascot and awarded with an exclusive hotel gift. Le Meurice has created a passport given to the children at their arrival taking their family on a (re)discovery of Paris’ little-known delights. Their very own passport map out a trail of city’s most magical sights. Tender teddies and toys to treasure for Le Meurice’s tiny tots! A delightful collection with which to enjoy a life of luxury from a tender age. Start right with souvenirs you will want to keep forever: Le Meurice has imagined a line of adorable gifts to remind baby of his or her first steps in the Parisian palace hotel. Thanks to its refurbishment, completed in 2000, Le Meurice offers the necessary facilities and equipment to welcome disabled clients in the best conditions. An adapted entrance, lifts and six rooms were especially designed for them. For a transfer from the airport to the hotel with a hostess waiting for you when getting out of the plane, for a trip round Paris, an excursion to Versailles or to the Châteaux de Loire… for all your requests, our Concierges will arrange everything on your behalf so you just have to enjoy the chauffeured car of your choice. Le Meurice has always been very welcoming to pets. During the renovations from 1905-1907, the workers took in a stray greyhound that had been living on-site. Hotel personnel then adopted the dog, and it soon became the mascot and inspiration for the Meurice’s emblem today – a pair of Greyhounds. Also, when Salvador Dali one of the Meurice’s regular guests, checked out, the hotel staff had to completely repaint the Suite Royale because his two tame ocelots particularly loved the carpets! •The grooms are pleased to walk dogs in the Tuileries Garden. 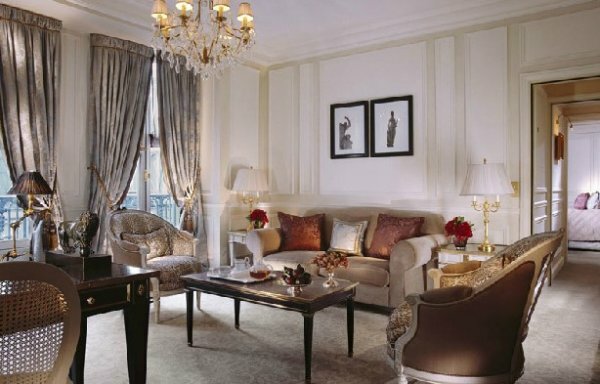 At Le Meurice, opulence and comfort are not confined to the hotel’s public areas alone. Every room and suite is a spacious, peaceful oasis of calm, providing guests with the ultimate in luxury. Each of the seven floors has a distinct style, with 160 beautifully appointed rooms decorated in a style redolent of Louis XVI. All rooms feature exquisite marble bathrooms with shower and bath. Each room is soundproofed and has air conditioning, wifi, multiple telephone lines and cable television. The hotel has five especially adapted rooms for disabled guests with full facilities, as well as a special entrance in the hotel lobby. Non-smoking rooms are located on the third and fourth floors of the hotel and are available upon request. This room, which overlooks the courtyard or the street, is decorated in Louis XVI style with period furniture. 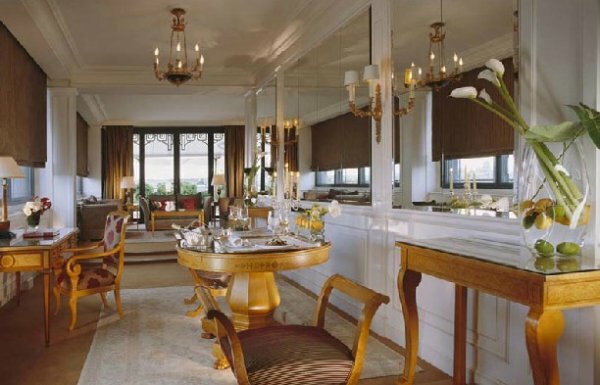 It has a private entrance, writing desk, closet space, minibar and an exquisite Italian marble bathroom. State-of-the-art technology fits seamlessly into the whole. This room, which overlooks the courtyard or the street, is decorated in Louis XVI style with period furniture. It has a private entrance, sitting area, writing desk, generous closet space, minibar and an exquisite Italian marble bathroom. State-of-the-art technology fits seamlessly into the whole. This spacious room, which overlooks the courtyard or the street, is decorated in Louis XVI style, with period furniture complemented by elegant fabrics. It has a private entrance, sitting area, large writing desk, generous closet space, minibar and an exquisite Italian marble bathroom. State-of-the-art technology fits seamlessly into the whole. Tranquillity and elegance come naturally to a room where, surrounded by every possible comfort, you will immediately feel at home. Luminosity and a unique sense of tranquillity fill this room which overlooks the courtyard or the street. The decoration is in Louis XVI style, with period furniture complemented by elegant fabrics. 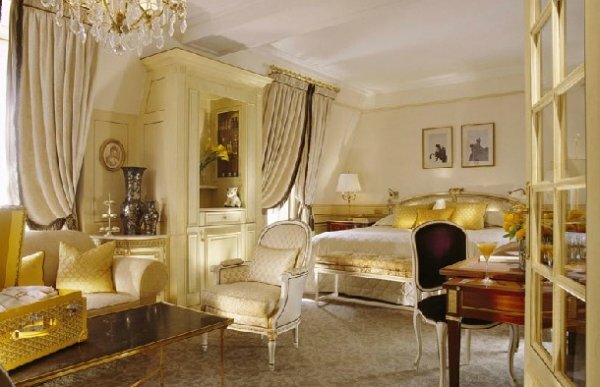 Every modern comfort has been seamlessly incorporated into the charm of classic French style. The room has a private entrance, sitting area, large writing desk, generous closet space and minibar. 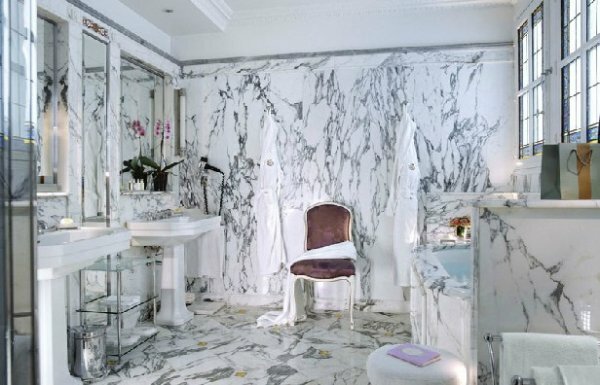 The opulent Italian marble bathroom completes this beautifully-appointed room to perfection. Luxury becomes an art and an enchantment. True to the spirit of Le Meurice, modern comfort blends harmoniously with the charm of classic French furnishings in Louis XVI style. Period furniture is complemented by elegant fabrics. The suite, which overlooks the courtyard or the street, has a private entrance, sitting area, large writing desk, minibar and an exquisite Italian marble bathroom with bath and walk-in shower. Time is suspended amid the tranquil atmosphere and elegantly muted palette of this Junior Suite. True to the spirit of Le Meurice, modern comfort blends harmoniously with the charm of classic French furnishings in Louis XVI style. Period furniture is complemented by elegant fabrics, capturing the essence of Parisian luxury in a suite that is bathed in light. The suite, which overlooks the courtyard or the street, has a private entrance, spacious sitting room, large writing desk, dressing room, minibar and an exquisite Italian marble bathroom with bath and walk-in shower. Time is suspended amid the tranquil atmosphere and elegantly muted palette of this Junior Suite. Connecting rooms are available. 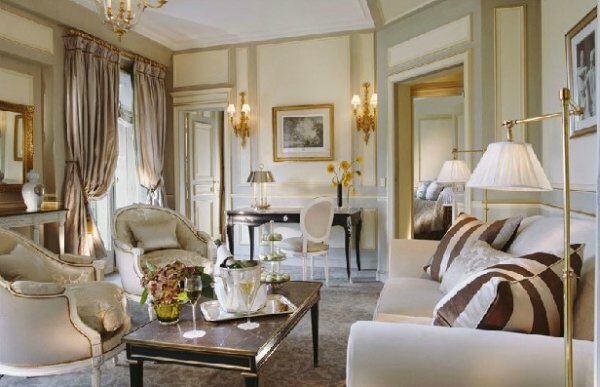 True to the spirit of Le Meurice, modern comfort blends harmoniously with the charm of classic French furnishings. Period furniture in Louis XVI style is complemented by elegant fabrics, capturing the essence of Parisian luxury in a suite that is bathed in light. The suite, which overlooks the courtyard or the street, has a private entrance, boudoir, large writing desk, dressing room, minibar and an exquisite Italian marble bathroom with bath and walk-in shower. Time is suspended amid the tranquil atmosphere and elegantly muted palette of this Junior Suite. There are 42 suites and junior suites, most of which overlook the Tuileries Garden and have spectacular views of the Paris skyline. 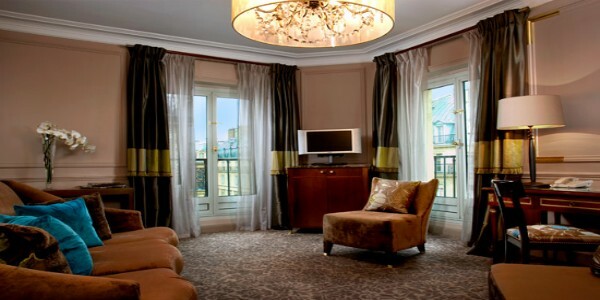 On the first floor, our two Presidential Suites offer high ceilings and sumptous furnishing throughout. Our Prestige Suites – on the second and third floors of the hotel – have their own beautifully designed living-rooms. The Marco Polo Suite on the sixth floor is the uniquely atmospheric apartment with an exoctic décor evoking the journeys of the 13th century traveller, whilst our Belle Etoile Suite, on the seventh floor, has a vast private terrace with spectacular panoramic views of Paris. True to the spirit of Le Meurice, modern comfort blends harmoniously with the charm of classic French furnishings in Louis XVI style. Period furniture is complemented by elegant fabrics, capturing the essence of Parisian luxury in a suite that is bathed in light. In addition to a courtyard view, it has a private entrance, a separate and spacious sitting room, a large writing desk, dressing room and minibar. 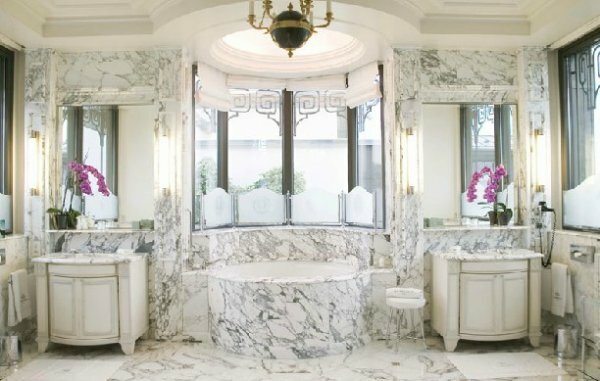 The exquisite Italian marble bathroom has both a bath and a walk-in shower. Time is suspended amid the tranquil atmosphere and elegantly muted palette of this suite. Connecting rooms are available. True to the spirit of Le Meurice, modern comfort blends harmoniously with the charm of classic French furnishings in Louis XVI style. Period furniture is complemented by elegant fabrics, capturing the essence of Parisian luxury in a suite that is bathed in light. In addition to a courtyard or street view, this spacious suite has a private entrance, generously-proportioned sitting room, separate from the bedroom, large writing desk, minibar and an exquisite Italian marble bathroom with bath and walk-in shower. The dressing room is large enough to accommodate your entire wardrobe. Noble materials and luxurious fabrics in elegantly muted shades transform this suite into a dream of opulence where time no longer matters. Connecting rooms are available. 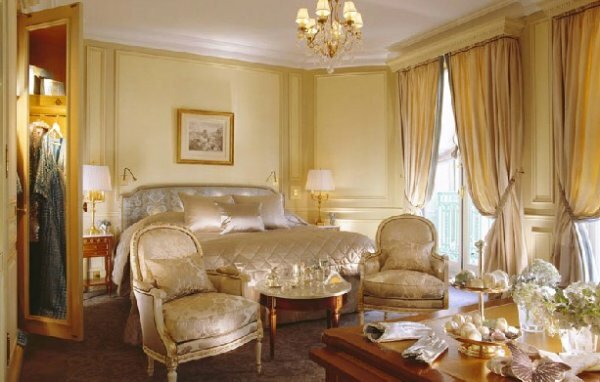 True to the spirit of Le Meurice, modern comfort blends harmoniously with the charm of classic French furnishings in Louis XVI style. Period furniture is complemented by elegant fabrics, capturing the essence of Parisian luxury in a suite that is bathed in light. 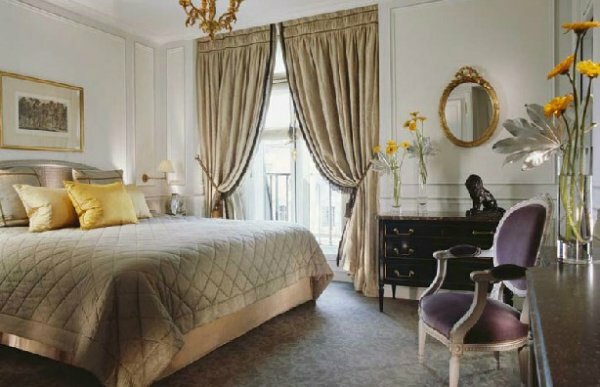 This spacious suite, which looks onto the Tuileries Garden, has a private entrance, generously-proportioned sitting room, separate from the bedroom, large writing desk, minibar and an exquisite Italian marble bathroom with bath and walk-in shower. The dressing room is large enough to accommodate your entire wardrobe. Noble materials and luxurious fabrics in elegantly muted shades transform this suite into a dream of opulence where time no longer matters. Connecting rooms are available. Escape from the everyday… a world awaits, high on the sixth floor. Close your eyes and push open the door to enchantment as you embark on a journey with this most legendary explorer. Now take a deep breath and open your eyes on the essence of eighteenth-century style. This 70 square-metre apartment is elegantly appointed in a romantic, poetic, French style. The spirit of Marco Polo is all around, in the ship-like curve of the eaves, the swathes of silk and precious fabrics, the exotic hardwood floor, the furnishings in the most noble materials, the Oriental artefacts and figurines. The open bathroom at the end of the suite is a haven of delight. A Baroque claw-foot tub stands on a marquetry floor of boxwood and Portuguese pink marble. A console table is festooned with vintage arabesques. Your journey begins here, beneath the stars and the sky! 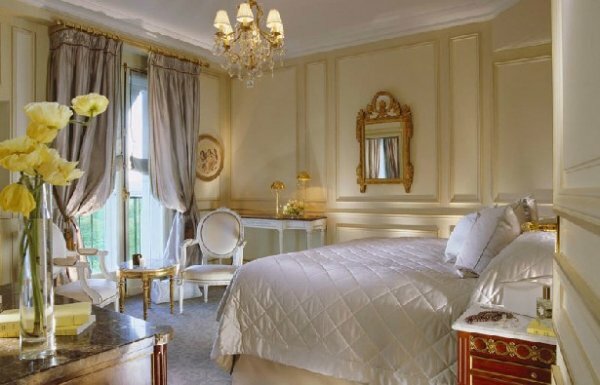 True to the spirit of Le Meurice, modern comfort blends harmoniously with the charm of classic French furnishings in Louis XVI style. Period furniture is complemented by elegant fabrics, capturing the essence of Parisian luxury in a suite that is bathed in light. In addition to a stunning view of the Tuileries Garden, this spacious suite has a private entrance, generously-proportioned sitting room, separate from the bedroom, large writing desk, minibar and an exquisite Italian marble bathroom with bath and walk-in shower. The dressing room is large enough to accommodate your entire wardrobe. Noble materials and luxurious fabrics in elegantly muted shades transform this suite into a dream of opulence where time no longer matters. Connecting rooms are available. 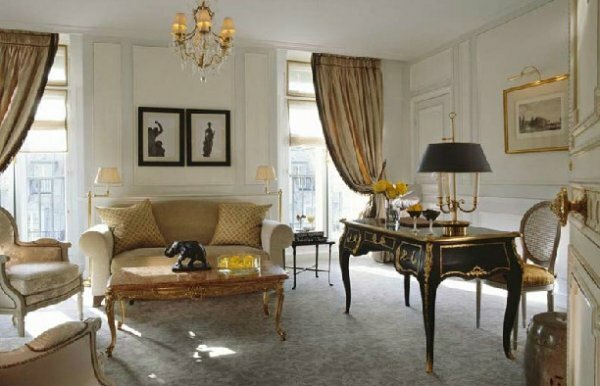 Tranquillity reigns in the heart of Paris, in exceptional surroundings of the highest rank. Located on the first floor Rivoli side, with a breathtaking view of the Tuileries Gardens and a spectacular panorama of Paris, enjoy luxury, tranquillity and beauty in the Presidential Suites. For more than thirty years, Salvador Dali took up residence on the first floor, in suite 102/103. Decorated in the finest French classical tradition with Louis XVI style furniture, this suite was the backdrop for the artist’s exploits and exhibitions. Experience the magic and splendour of the Versailles style, with towering moulded ceilings, vast windows and a sense of panache. This suite is composed of a bedroom, a separate sitting room, a private entrance, a large writing desk, an Italian marble bathroom with bath and shower, and a walk-in closet. There is also a butler’s pantry. Communicating doors allow a second Presidential Suite 106/107 to be added, forming a completely private, 300 square-metre space composed of two bedrooms and two sitting rooms. Alternatively, a Junior Suite can be added to a Presidential Suite to create a 210 square-metre space composed of two bedrooms and a sitting room. Finally, all the rooms on the floor can be joined for a total of 360 square metres, composed of three bedrooms and two sitting rooms. For absolute discretion, the entire floor can be transformed into a private space, on request. A hint of surrealism in a Parisian decor for you to compose at will. Nothing compares. 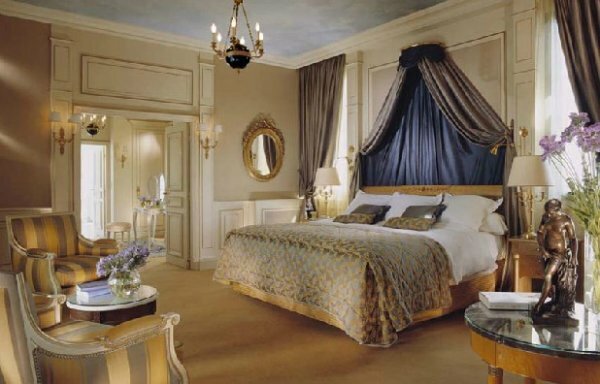 The Belle Etoile suite is quite simply the most stunning in Paris. 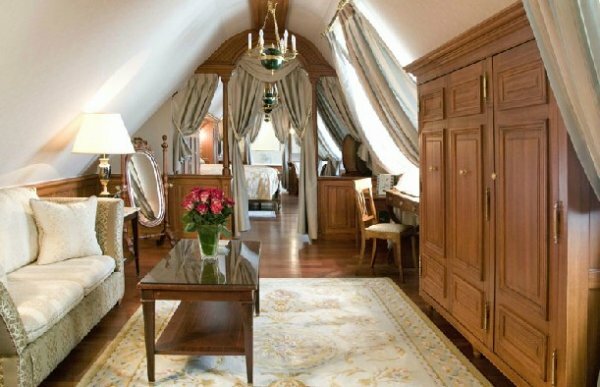 Located high above the rooftops on the seventh floor, this unique suite lays Paris and its monuments at your feet. The 250 square metres (2691 sq ft) of private terrace offer an extraordinary 360° view from Notre Dame to the Musée d’Orsay, from the Eiffel Tower to the Grand Palais, from Place de la Concorde to the Arc de Triomphe, from the Opera to the Sacré Coeur. Equally spectacular are the dimensions of the suite: 275 square metres (2960 sq ft) of magnificence and light, decorated in a nineteenth-century style, with private elevator access, sitting room, dining room, walk-in closet and bedroom with a bathroom in exquisite Italian marble. There is also a pantry and a kitchen for a butler and personal chef. The suite’s architecture recalls such Parisian landmarks as the Eiffel Tower and the Petit Palais, a characteristic style of the late nineteenth century in which metal and glass combine with the green patina of zinc roofs. The master bedroom features a spacious bed with a midnight-blue canopy from which to admire the Place Vendôme column, the Opéra Garnier and the Sacré Coeur. The bedroom leads into a magnificent, 25 square-metre walk-in closet and, from here, a magical bathroom. This precious marble jewel is appointed with a whirlpool bath and multi-jet shower. 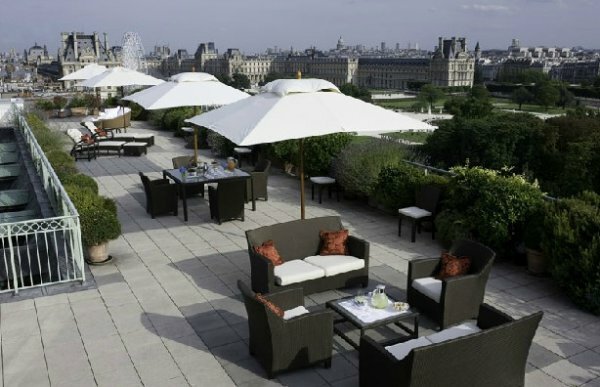 It too offers an unforgettable view of Paris. 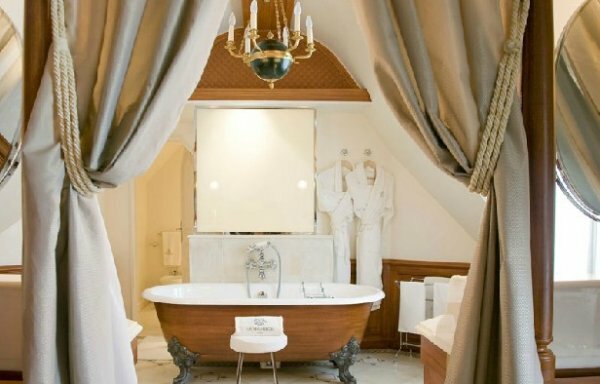 Sink into the tub and admire Montmartre and the Sacré Coeur on one side, the Musée d’Orsay and the golden dome of the Invalides on the other. The Belle Etoile suite communicates with two bedrooms on the sixth floor to form a duplex, or with a bedroom on the seventh floor. 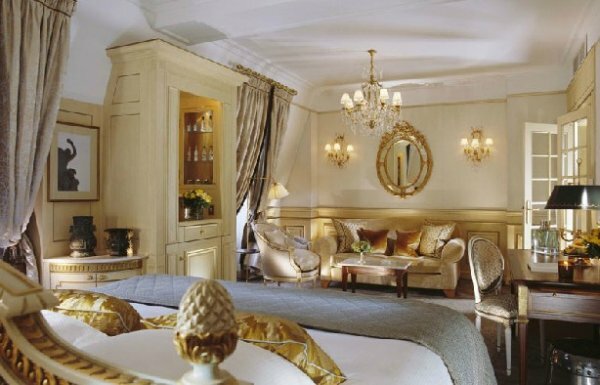 With the addition of these rooms, the Belle Etoile suite forms a single 370 square-metre space with four bedrooms. When at night the city lights merge with the twinkling stars, and the full moon hovers above the Louvre, the tableau is complete. 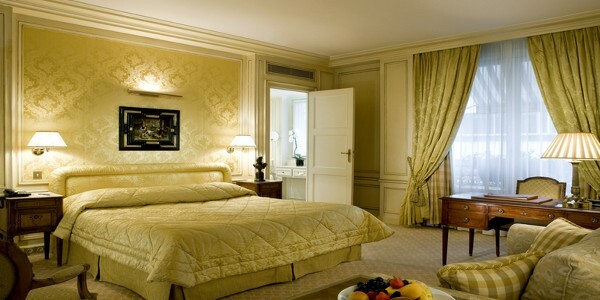 The Belle Etoile suite is Paris’ brightest star, which Le Meurice dedicates to the kings and queens of our world. Highly acclaimed by food writers worldwide, three michelin star Chef Yannick Alléno creates menus according to his own distinctive style of refined, harmonious and healthy cuisine. Rigorous and inventive, he only works with the best of Parisian products coming from the French terroir. He also has a passion for exotic products. Surrounded by his dedicated team, he transforms every meal into an extraordinary experience of the senses. At breakfast, lunch or dinner, restaurant Le Meurice offers a rich, subtle and varied menu. With precision, without extravagance, faithful to true flavours and excellently presented, Chef Yannick Alléno’s three Michelin-star cuisine is modern and audacious. Restaurant Le Meurice is a veritable gastronomic tour including a new concept of tableware called Ondes © an unseen collection of plates designed by Yannick Alléno himself, the tour then continues with a champagne bar and a refrigerated wine cellar open to the dining room containing 616 bottles. The oldest bottle is a Château Cos D’Estournel 1928 Saint Estèphe and the most recent one is a Romanée Conti Grand Cru 2004. Last but not least, the Chef’s table placed in his kitchen… You certainly won’t get bored! Your palate will be astonished by the variety of savours and your eyes will be delighted by the dining room’s wonderful decor. Inspired by the Salon de la Paix at Château de Versailles, the decor of restaurant le Meurice reinterpreted by Philippe Starck in 2007, really is an invitation to a unique rapture. This 17th century “grand siècle” style decor is based on three paintings dating from 1905 to 1907, the first phase of the refurbishment of Le Meurice since it opened. Theophile Poilpot (1848-1915) was a French Académie painter who painted in the “pompier” style. Beyond the majestic gilded glass door, discover ancient mirrors, chandeliers and noble materials such as bronze, marble and other frescoes. 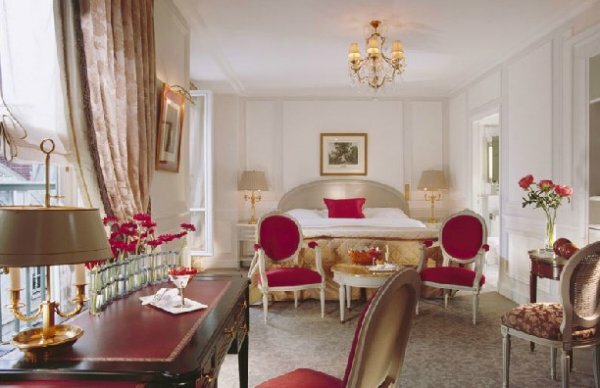 Experience romantic elegance at its greatest, through the grand windows overlooking the Tuileries Gardens. This pure white and silver decor combined with natural daylight conveys a feeling of harmony on this extraordinary room. Lunch: 12.30 a.m. – 2.00 p.m.
Dinner: 7.30 p.m. – 10.00 p.m. Dress code: A suitable attire is recommended. A Jacket is compulsory at dinner. Restaurant Le Dali is an irresistible temptation to relax and enjoy various delicacies throughout the day… It is definitely a place for encounters and a moment to savour. Settle down beneath the keystone of the Philippe Starck’s project, involving a giant canvas painted by his daughter Ara Starck & measuring 145 sqm / 1560 sqf. The gold and ochre hues will transport you to a captivating world of interpretations. In this grand space where Dali’s spirit still reigns supreme, discover the many references to Dali’s work, such as a Daliesque chair with feet in the form of ladies shoes, a lamp with drawers, or Le Meurice’s recognizable lobster on a telephone. These elements all add to the mystical aura of the place and makes it totally Daliesque! Lunch: Noon to 3.30 p.m. Tea Time: 3.30 p.m. to 6.30 p.m.
Like the festive night scene at Château de Fontainebleau portrayed in the three restored Lavalley paintings hanging on its walls, the Bar 228 offers guests an ideal respite, complete decadent cocktails and lavish décor. The evening sky gives the bar a cozy-but-rich feeling. This setting combined with a selection of over 50 whiskies and malts will keep guests warm throughout the year. 300 drink references are available at Bar 228, among them 17 exclusive creations, such as the Cocktail Starcky or The 228. Every evening, enjoy two jazz musicians who liven the soul of Le Meurice, from 7 p.m. to midnight. The pianist is accompanied by a bass guitarist, a guitarist or a drummer. Open everyday from noon to 2 a.m.
A simple phone call and the Room Service team will satisfy your requests, based on a menu overseen by Executive Chef Yannick Alléno and available 24 hours a day. Your choice will be the best, and your favourite dish shall be served to your room.